We recently did a collaboration with Brian Scott Hampton, an amazing artist from Oklahoma. His futuristic graffiti style eye candy is something else! 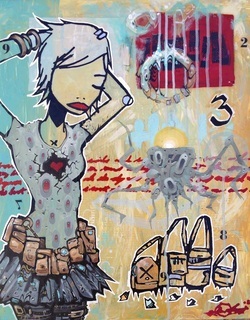 We recently did a collaboration with Aaron Kraten, a self taught mixed media artist from southern California. Aaron sent us a piece he started and we worked with his unique style to create a piece that's different from anything we've ever done. 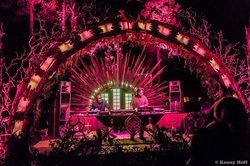 Our friends over at Audiowaska Productions built the main stage for Raindance Campout that was inspired by our painting titled "The Keeper Of Time". It was amazing to see a group of such talented people take one of our two dimensional pieces and interpret it into an interactive three dimensional sculpture. Looking forward to getting more involved with projects like this in the future!